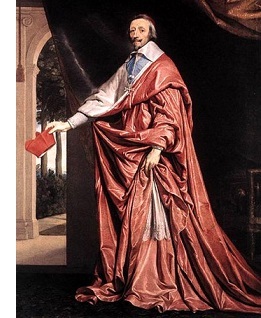 Cardinal Richelieu (1585-1642) - The clergyman who dabbled in politics. That's not unheard of, but Cardinal Richelieu was perhaps more successful at it than any other (however, there was a King of Portugal, Henry, who was also a Cardinal, making him the only cardinal-king in history). Armand du Plessis (his given name) had originally planned on a military career. But poor health as a child and an ecclesiastical grant to his family from the king as reward for his father's participation in the French Wars of Religion, necessitated that he become a priest. In 1607 he was consecrated Bishop of Luçon. His first political position came in 1616 when King Louis XIII made him Foreign Affairs Secretary. In 1622 he became Cardinal, making him the highest Catholic official in France; and then in 1624, he reached the height of power when Louis appointed him Chief Minister. He held both positions (Cardinal and Chief Minister) until his death. As a French official, one of his primary duties was to deal with the Habsburgs, one of the most powerful ruling families in Europe at the time (and rival of the Bourbons of which Louis XIII belonged). The Habsburgs ruled both Spain and Austria, leaving France potentially vulnerable as it sat between the two. Richelieu's actions demonstrated that he was loyal to his country first and the church second. In 1623, a dispute developed in Lombardy (Northern Italy) in a valley known as Valtellina. Spain tried to secure the region as a line of communication between it and Austria. Richelieu successfully prevented this by allying with the Swiss Canton of Grisons, a Protestant state. He sent troops to the region to drive out the Pope's army which was at war with the kingdom He also played a role in the Thirty Years' War, which raged in Central Europe at the time. Although France was not directly involved, Richelieu provided aid to many of the Habsburg's enemies (again often Protestant) in order to weaken their power. Domestically, he was an important adviser to the king who was battling the Huguenots, a large Protestant minority in France. He also was the king's instrument in centralizing power by stripping it from the nobility. As a result, Richelieu was almost universally hated by the aristocracy. Because of his position and the power he wielded, he is often considered the first prime minister in history. Some say he was even more powerful than the king himself, which may have been true; but his portrayal in Alexander Dumas' novel, The Three Musketeers, probably contributed heavily to that perception.